I’m honored to have an article in Ms.–co-authored with ny intersex colleague and friend Georgiann Davis, PhD– about why the Olympics’ Testosterone regulations for Women are anti-intersex & unfair. Enjoy! 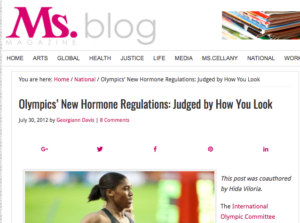 ← Radio: Hida on the Olympics, discrimination, intersex, surgeries, and more….